1) Follow us on Twitter. We post interesting links and updates on our twitter feed. 2) Join our Facebook Page. The Facebook Page is a great place to meet other people that are using KallOut and discuss things on the forum. There is even a place where you can upload your own KallOut photos and videos. 3) Email Us. We really like hearing what people think of the product. If you have a great idea for how KallOut can improve contact us via email. 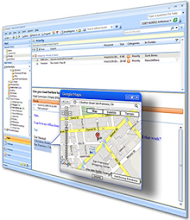 Some of our most popular features (Custom KallOuts, tear-off windows, LinkedIn BestGuess, etc.) have come directly from user comments. Stay tuned because an update is coming soon to the KallOut API. Sign up on our developer page to gain early access. 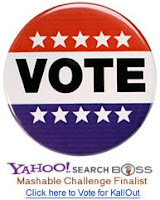 KallOut is a finalist in the Yahoo BOSS Mashable Challenge. The contest runs until this Sunday and the winner will get $2000 and an article in Mashable. We want to win and need as many votes as possible before the contest ends. Take a second to show your support and Vote for KallOut. You can also help out by spreading the word on Twitter or your blog. Thanks!